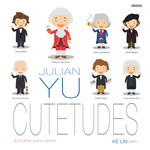 Cutetudes : and other piano works / composer: Julian Yu ; Ke Lin piano. Impromptu : for piano op. 9 / Julian Yu. 14 Aug 87: Conservatorium of Music, Brisbane, Queensland. Featuring Kevin Power.